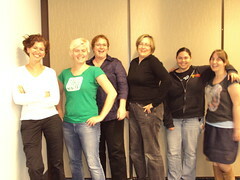 GirlDevelopIt Sydney: Round 1, A Success! As I posted in August, GirlDevelopIt is an initiative to increase the number of women in tech through low-cost programming workshops. It was created in New York and is thriving there (on their 27th class now! ), and I wanted to try bringing it here to Sydney, Australia. We started here with the basics, a 5-lesson course on HTML & CSS, with the hope of expanding to more topics if there was enough interest. We ended up filling the room with 40 eager female students from varied backgrounds - like marketing, travel, advertising, and photography - plus 6 super talented teaching assistants of various expertise - like SEO, startups, and standards. At the end of the course, students put together their own personal website to show what they'd learnt, and it was awesome seeing the unique webpages that each of them put together. All in all, I would call this experiment a success, and I'm excited to see the momentum continue. We have an upcoming lecture with 30 RSVPs, we have a new offer of sponsorship (thanks to ThoughtWorks), and more importantly, we have 60 members in our meetup group who are all ready and willing to become women developers. We could use spare laptops for the workshops, if you have any old ones lying around. They typically just need a web browser like Chrome and a text editor like Notepad++. We would love for a hosting company to provide students in the courses with FTP accounts and a teeny amount of disk space. We used my server for the last round, but we couldn't do more than 8 simultaneous logins on mine, so it was not ideal. We can currently get 10 free books from O'Reilly for each course, but if we had a sponsor (like a bookstore) that would provide free books for every student (~40), that would be just amazing. We would love to have GDI branded t-shirts to give to the students, to help them feel proud of their involvement and to spread the message. Thanks to Kate Carruthers for the embedded photo.